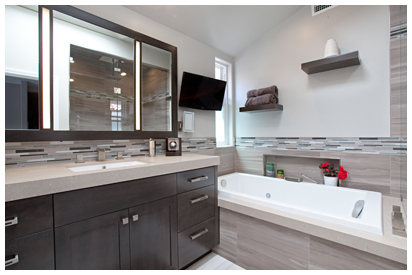 AAA Kitchen+Bath Remodel is Orange County’s Premier location for all your remodeling needs. Lance Carlson, owner and operator of AAA Kitchen+Bath Remodel, has been designing kitchens and bathrooms for luxury homes for three decades. With a background in interior design, Lance began remodeling for custom builders over two decades ago. His eye for color, lighting and fixtures quickly became evident. You’ll love his eye for detail and extreme attention to usability and comfort. Just check out his reviews on yelp. Our Design Team includes Allied Member ASID, Monica Olson of Casafina Interior Design. Monica brings a fresh perspective with over 20 years experience. This innovative and inspired designer works closely with our clients to bring their vision to life, paying close attention to every detail ensuring their aesthetic aspirations match with their budget and timeline. At AAA Kitchen+Bath Remodel we’ll listen to your unique needs, dreams and goals to create spaces that align with your design style and enhance your lifestyle. We’ve built relationships with a wide range of trade-only vendors, allowing us to bring you those sources at exceptional value, making the most of each client’s budget. We offer everything from custom cabinetry to upholstery, servicing residents all over Southern California from San Clemente to Manhattan Beach. The team at AAA Kitchen+Bath Remodel is committed to helping customer’s achieve their goals. Whether you are embarking on a new construction project, a gut renovation or looking to furnish your existing space, our interior design team will guide you through the design process and into your dream home. We offer only the best product lines, including; Omega Cabinets, Arizona Tile, Anderson Flooring and much much more. Take a look at our portfolio for ideas and inspiration. Finally, call our show room today at 714-715-0420 to schedule your FREE in-home estimate! No matter the style your looking for; traditional, modern or contemporary, Lance and Monica can make it happen!